In days of old, oxtails came from oxen, but today they are simply the tails of beef cattle or veal of both genders. Eating oxtails date back as far as the consumption of beef when all of an animal was used and no part went to waste. The tail made a wonderfully hearty soup that stretched a small amount of meat with the addition of any variety of vegetables. Oxtail soup has become comfort food for many, it's no wonder so many people are wondering how to cook oxtail. Cooks around the world have long made use of oxtails with variations on a theme. Today, upscale chefs are rediscovering oxtails to the nostalgic delight of older patrons and the wonder of the younger crowd who consider it an exotic meat. Because of the tail's makeup, however, it does need to be cooked in certain ways for the best results. Oxtail is sold in sections, and since oxtail is really a tail, it is thick at one end and thin at the other, so you will get some pieces that are meatier than others. 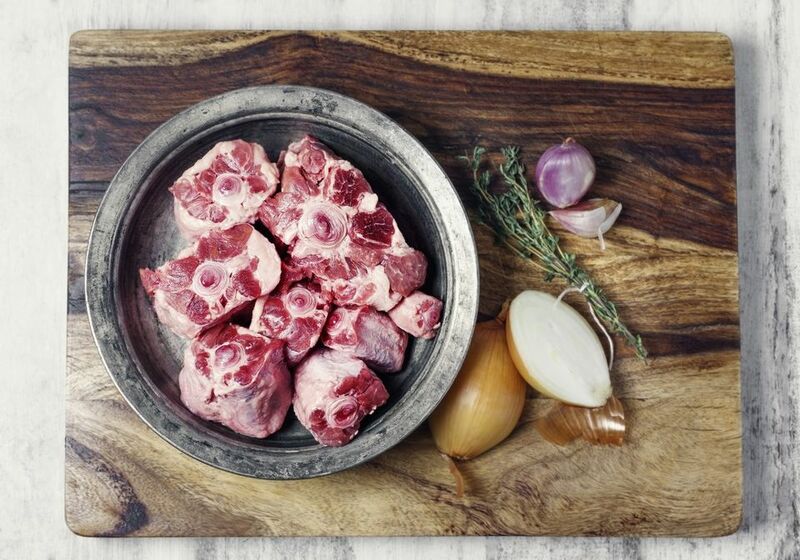 With the oxtail being mainly bone, cartilage, and connective tissue, it has very little meat. This is why it benefits from slow cooking in the moist heat. Because they are very boney with little meat, oxtails are ideal for making stock and happen to make the most flavorful beef stock. For the most part, the robust beef flavor comes from the bones and marrow, but the meat is also very tasty. The rendered stock will be thick and gelatinous due to the collagen released. This stock is the basis for oxtail soup—which includes the meat, vegetables, barley, herbs and often sherry or Madeira—as well as rich, hearty stews. Although oxtails are being used for much more than soup or stew nowadays, long, slow braising in a liquid is the preferred method to derive a tender result while drawing maximum flavor from what is very little meat. Slow cooking turns the bone and cartilage into gelatin that is rich in flavor and makes a delectable sauce. When braising oxtail, plan on a long cooking time. Oxtails work particularly well in slow cookers and pressure cookers.